Plant-based diets really do lower cholesterol, according to a review of nearly 50 studies. Vegetarians generally eat more greens, fruits and nuts which means they have a lower intake of saturated fat, researchers found. These foods are naturally rich in components such as soluble fibre, soy protein, and plant sterols (a cholesterol found in plants), all of which lower cholesterol. High cholesterol is particularly dangerous as it often goes undiagnosed and therefore untreated. It is associated with increased risk of coronary heart disease, strokes and vascular diseases. The authors suggest eating more greens could be a good preventive care for people who might be concerned about their cardiovascular health – helping them to address the problem before it’s too late. Cholesterol is a fatty, wax-like substance, is present in every cell in your body. 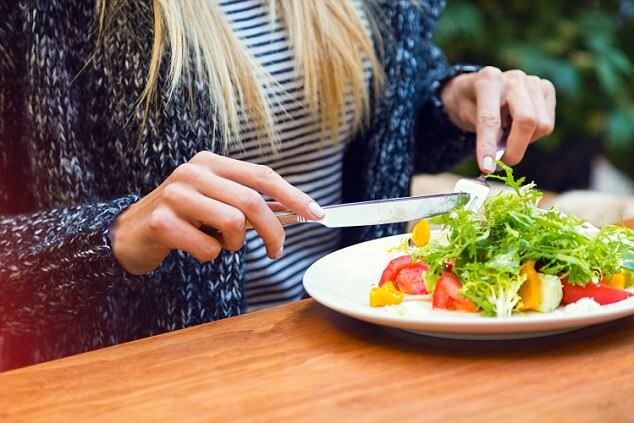 Research led by Dr. Yoko Yokoyama, from Keio University in Fujisawa found vegetarians had 29.2 milligrams less of total cholesterol per decilitre (one tenth of a litre) than meat-eaters. For the review, researchers took ‘vegetarian diets’ to mean a diet that includes eating meat products less than once every month. The worrying results from a tuberculosis vaccine trial on monkeys before they tested the treatment on hundreds of babies were ignored by scientists at Oxford University, a former principal research fellow at the institution has claimed. Professor Peter Beverley said that plans to inoculate almost 1,500 children were drawn up without disclosing data that seemed to show that primates given the immunisation in a trial appeared to “die rather rapidly”. He told the BBC’s File on Four that it “seemed a little bit strange” that most of the primates treated with the vaccine were having to be put down after they became ill.
“Certainly here in this experiment, there is no evidence whatsoever that this is an effective booster vaccine,” he said. Trials on monkeys saw all of them infected with TB. However, one group was given the widely used Bacillus Calmette-Guérin (BCG) jab, the second as given no immunisation and a third was given BCG plus new vaccine. The trial had started 10 months before a funding application was made for the clinical trial on over 2,800 babies near Cape Town. Almost half of the infants taking part were given the new vaccine. By that time, of the six monkeys who received only the BCG injection, just two died, while five out of six of those that received the BCG jab and the new booster vaccine together had to be put down. Professor Beverley claimed regulators were not given this information when they came to assess the application. The university insisted that all of the data from the study was shared with the South African regulators. It pointed to the fact that the vaccine had already passed the animal testing phase and had been safely tested on 424 people before the 2009 study began. Researchers concluded that the amount of TB bacteria used in the study was too high, which lead to the high level of fatalities among monkeys given the vaccine, they said. 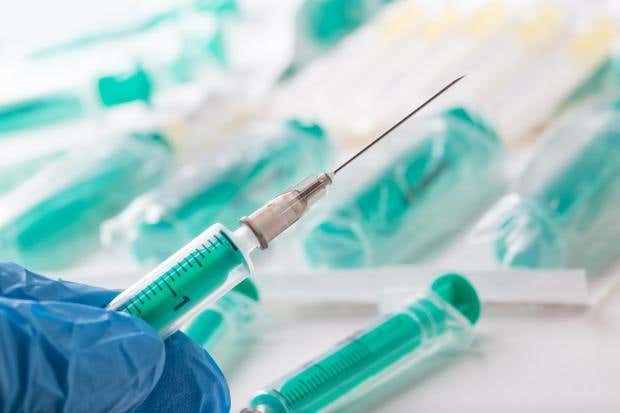 Public Health England said that since it was not a pre-clinical trial to support the progression of the vaccine into humans, but instead a separate trial that would inform future animal tests, the results were not relaeant. An investigation into Professor Beverley’s complaint found no wrongdoing took place. Historic CAR-T launch marks market’s first foray into ‘living drugs’ individually tailored to each patient. 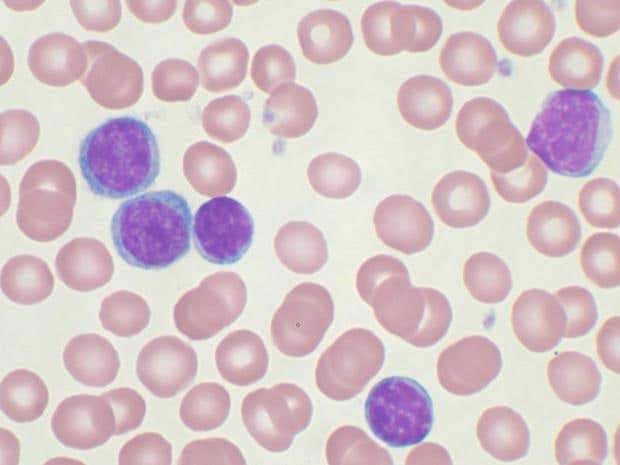 Opening a new era in cancer care, US health officials have approved a breakthrough treatment that genetically engineers patients’ own blood cells into an army of assassins to seek and destroy childhood leukaemia. The Food and Drug Administration called the approval historic, the first gene therapy to hit the US market. Made from scratch for every patient, it’s one of a wave of “living drugs” under development to fight additional blood cancers and other tumours, too. ​CAR-T treatment uses gene therapy techniques not to fix disease-causing genes but to turbocharge T cells, immune system soldiers that cancer too often can evade. Researchers filter those cells from a patient’s blood, reprogramme them to harbour a “chimeric antigen receptor” or CAR that zeroes in on cancer, and grow hundreds of millions of copies. Returned to the patient, the revved-up cells can continue multiplying to fight disease for months or years. It’s a completely different way to harness the immune system than popular immunotherapy drugs called “checkpoint inhibitors” that treat a variety of cancers by helping the body’s natural T cells better spot tumours. CAR-T cell therapy gives patients stronger T cells to do that job. “We’re entering a new frontier in medical innovation with the ability to reprogramme a patient’s own cells to attack a deadly cancer,” said FDA Commissioner Scott Gottlieb. The first CAR-T version, developed by Novartis and the University of Pennsylvania, is approved for use by several hundred patients a year who are desperately ill with acute lymphoblastic leukaemia, or ALL. It strikes more than 3,000 children and young adults in the U.S. each year and while most survive, about 15 percent relapse despite today’s best treatments. Still, “a far higher percentage of patients go into remission with this therapy than anything else we’ve seen to date with relapsed leukaemia,” said Dr. Ted Laetsch of the University of Texas Southwestern Medical Center, one of the study sites. “I wouldn’t say we know for sure how many will be cured yet by this therapy. There certainly is a hope” that some will be. Most patients suffered side effects that can be gruelling, even life-threatening. An immune overreaction called “cytokine release syndrome” can trigger high fevers, plummeting blood pressure and in severe cases organ damage, side effects that require sophisticated care to help patients without blocking the cancer attack. The FDA designated a treatment for those side effects Wednesday. Among concerns, sometimes leukaemia can develop resistance, and sometimes patients worsen while waiting for their new cells, said Sekeres, who directs the Cleveland Clinic’s leukaemia programme and wasn’t involved with CAR-T testing. 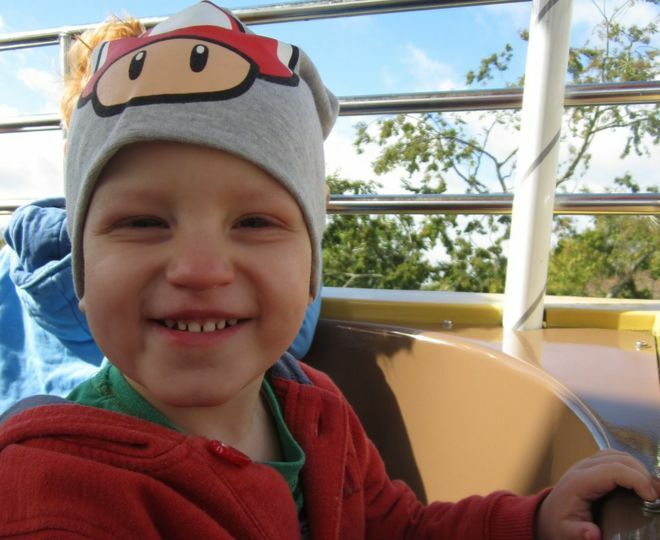 “Unfortunately leukaemia grows so rapidly that it can evade even the smartest of our technologies,” he added. To better ensure patient safety, the FDA is requiring Novartis to offer CAR-T therapy only through medical centers specially trained and certified to handle the complicated treatment. Novartis expects to have 32 centres around the country, mostly in large cities, running by year’s end, with the first 20 offering care within the next month. On a conference call Wednesday, Novartis executives said the company is working with the Medicaid program and private insurers and expects broad coverage, and will offer some financial assistance with such things as travel costs. But they didn’t promise all patients would be able to get the therapy. “This is a turning point in the fight” against ALL, said Penn’s Dr Carl June, who pioneered the therapy. Scientists around the country also are trying to make CAR-T therapies that could fight more common solid tumours such as brain, breast or pancreatic cancers — a harder next step. Genetic variations linked to illnesses less likely to endure in people who live longer, who in turn are more likely to pass on their genes, new research suggests. 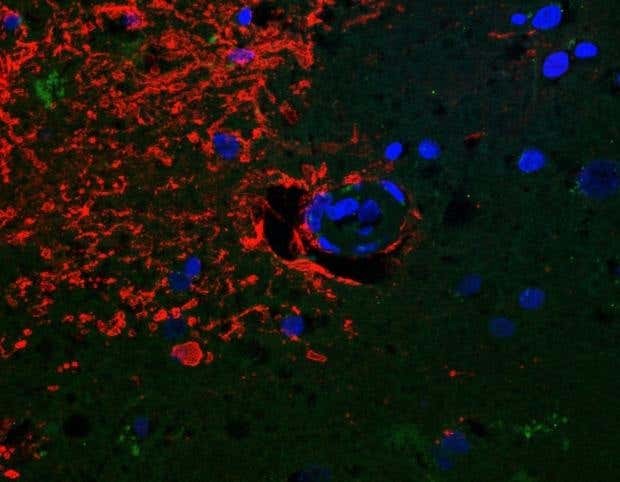 Genes linked to Alzheimer’s disease, asthma and high cholesterol are being “weeded out” by natural selection, a study has found. Scientists at Cambridge and Colombia universities discovered that genetic variations associated with these illnesses were less common in people who lived longer. Those who survive to an older age are more likely to successfully pass on their genes than people who die relatively young, the researchers said, and therefore these traits for good health become more common in the human gene pool. The study, published in the journal PLOS Biology, suggested that natural selection is slowly eliminating negative traits to adapt to our changing lifestyle. It said even genetic variants with late onset effects, such as those linked to Alzheimer’s, were being “weeded out”. “It’s a subtle signal, but we find genetic evidence that natural selection is happening in modern human populations,” said Joseph Pickrell, one of the study’s authors. In theory, illnesses such as Alzheimer’s could be wiped out of the human species within a few thousand years. The team studied the genetic make-up of 150,000 Britons and 60,000 Americans to analyse human evolution. It also discovered that people who were genetically pre-disposed to hitting puberty later and those who had their first child later in life were living longer. A one-year delay in puberty lowered the death rate by 3-4%, while a one-year child-bearing delay lowered the death rate by 6%. The researchers said traits linked to longer lifespans now may not be useful in the future as conditions change. To better understand genetic mutations and why they arise, researchers will need to study “millions of samples in the pipeline”, they said. An eye infection caused by a parasitic worm increasingly common in mainland Europe could spread to the UK, pet owners are being warned. The disease, Thelazia callipaeda or oriental eye worm, is transmitted by a type of fruit-fly that lands on the eyes and deposits infective larvae. Cats, dogs and people catch it from the flies, which feed on eye secretions. There have been three recent canine cases reported in the UK, but the animals had been imported from abroad. One had been brought to the UK from Romania. The other two had recently travelled to mainland Europe with their owners. All made a full recovery following drug treatment and eye washes to flush out the adult worms. Britain has the same type of fruit-fly – Phortica variegata – and the concern is these could become infected and then spread the condition to people and animals in the UK, says veterinary expert John Graham-Brown, from Liverpool University, in the BMJ publication Veterinary Record. Mr Graham-Brown said there was no risk of people catching the infection directly from their pets. But dog owners should be on the lookout for signs of the infection in themselves and their pet if they had recently travelled to places where the disease was endemic. Italy, France, Switzerland, Germany, Spain, Portugal, Bosnia-Herzegovina, Croatia, Romania, Bulgaria, Hungary, Greece, Belgium and Serbia have reported locally transmitted cases. 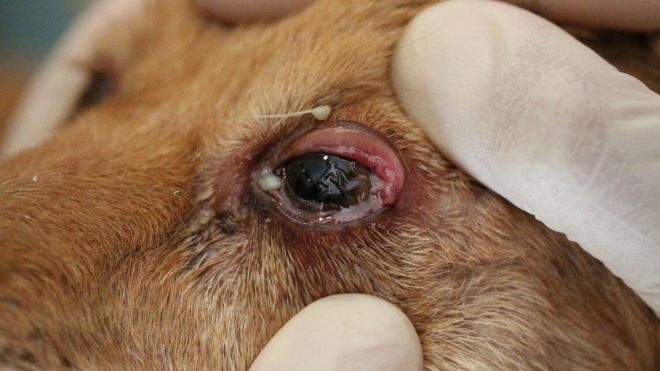 Infected animals show a variety of symptoms, from mild conjunctivitis (pink eye) to severe corneal ulceration, which, if untreated, can lead to blindness. Fully grown adult worms might also be visible, but the microscopic larvae cannot be seen with the naked eye. Mr Graham-Brown said: “So far, there has been only one strain of the infection round in Europe. But it’s been spreading quite rapidly recently. We are not sure why. The flies tend to be found in areas of oak woodland during warmer months. Sales of a sterilisation device are being halted in all countries bar the US, weeks after the Victoria Derbyshire show reported it could cause problems. The Essure implant, which is available on the NHS, has left some women in chronic pain, and some have even needed hysterectomies to remove it. The pharmaceutical company Bayer said the decision to stop sales was being taken for commercial reasons. The sale of the implants in the EU was temporarily suspended last month. Bayer has asked hospitals in the UK not to use their existing stocks during this time. They are inserted into the fallopian tubes where they are designed to trigger inflammation, causing scar tissue to build up and eventually block the tubes, known as a hysteroscopic sterilisation. Because of the way the coils attach to the fallopian tubes, the only way to take them out is to remove a woman’s fallopian tubes and often her uterus. Laura Linkson, who was fitted with the Essure device in 2013, told the BBC’s Victoria Derbyshire programme the pain had left her suicidal. “The device was sold to me as a simple and easy procedure. I was told that I’d be in and out of the doctor’s office in 10 minutes and that there’d be no recovery time. “I went from being a mum who was doing everything with her children, to a mum that was stuck in bed unable to move without pain, at some points being suicidal. “I felt like I was a burden on everyone around me,” she added. The US is the biggest market for the product. More than 15,000 women have reported problems to the US Food and Drug Administration, which include “pain”, “allergic reactions” and the coil moving to other parts of the body. Last year, the FDA ordered Bayer to carry out long-term testing on Essure and put a warning on its packaging. A spokeswoman for the FDA said it was aware Bayer was no longer marketing Essure outside the US and the company had confirmed it was committed to continuing the testing as ordered. A statement from Bayer said: “We would like to reassure all patients, especially those with Essure, as well as health professionals, that this decision has been taken for commercial reasons and is not linked to any problems with safety or with the quality of the product. “According to our scientific assessment, the positive risk-benefit ratio of Essure remains unchanged. The blueprint for life – DNA – has been altered in human embryos for the first time in the UK. We have all journeyed from a single fertilised egg to a human being – built from myriad different tissues ranging from bone to those needed to read this page. Breakthroughs in manipulating DNA have allowed the team at the Crick to turn off a gene – a genetic instruction – suspected to be of vital importance. The easiest way of working out how something works is to remove it and see what happens. So the researchers used the gene-editing tool Crispr-Cas9 to scour the billions of letters of genetic code, find their genetic target and break the DNA to effectively disable it. They were targeting a gene. You are unlikely to have heard of it, but OCT4 is a superstar in early embryo development. Its complete role is not understood but it acts like an army general issuing commands to keep development on track. The researchers used 41 embryos that had been donated by couples who no longer needed them for IVF. After performing the genetic modification, the team could watch how the embryos developed without OCT4. Over the course of the first seven days, a healthy, normal embryo goes from one cell to about 200. It also goes through the first steps of organising itself and handing out specialised jobs to different cells. The embryo forms a hollow sphere called a blastocyst, with some cells destined to go on to form the placenta, some the yolk sac and others, ultimately, us. But without OCT4 the blastocyst cannot form. It tries – but implodes in on itself. It is the first time human embryos have been edited to answer questions about fundamental biology. Dr Kathy Niakan, a group leader at the Crick in London, told the BBC: “When it seemed it was working we were quite excited about the possibility that this would open up. By deepening understanding of the earliest moments in life, it could help explain what goes wrong in infertility. During IVF, of 100 fertilised eggs, fewer than 50 reach the blastocyst stage, 25 implant into the womb and only 13 develop beyond three months. This study alone, published in the journal Nature, cannot explain what is going wrong or why some women miscarry. But by interrogating all the genes suspected of playing a role in our inception, it could lead to new advances. One option for IVF is to have a better way of testing which embryos are going to be successful. Or it may be possible to boost embryos during IVF by growing them in a different culture media – a fertiliser for fertilised eggs. These experiments have been legal since 2008 in the UK, where it is possible to manipulate such embryos for 14 days as long as they are not implanted. But while this application of the technology is answering fundamental questions of science, other research groups are trying to remove genes that cause disease. That is provoking deep ethical debate. Dr Sarah Chan, a bioethicist at the University of Edinburgh, told the BBC: “I don’t think this study should raise any ethical concerns. “It is very clear that the aim of the research was basic science and that there was never any intention to create genetically modified human beings. 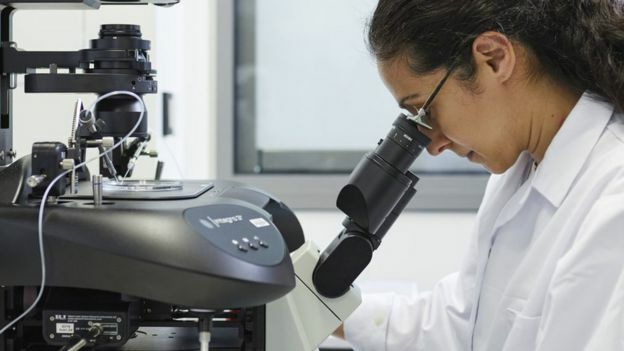 Dr Rob Buckle, the chief science officer at the UK Medical Research Council, said: “Genome editing technologies are having a game-changing effect on our ability to understand the function of critical human genes. Antimicrobial resistance a ‘global health emergency’ that ‘will seriously jeopardise progress in modern medicine’, says head of international organisation. 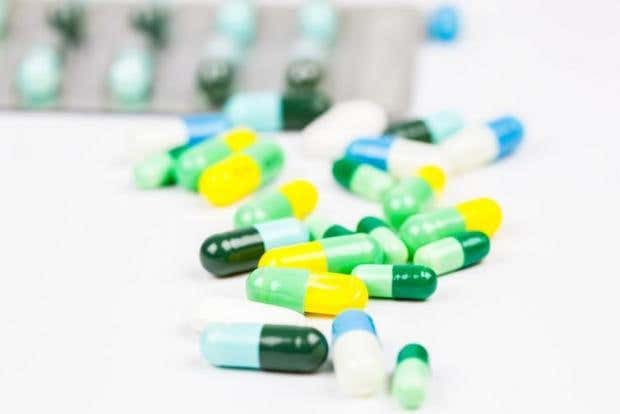 Not enough new antibiotics are being developed to combat the threat of deadly drug-resistant infections, the World Health Organisation (WHO) has warned. The vast majority of the drugs being developed are modifications to existing kinds of antibiotics, which only provide short-term solutions, the health organisation said in a new report. Commenting on the findings, the head of the international body described antibiotic resistance as a “global health emergency” that would take medicine back to the period before the Second World War unless new classes of antibiotics were developed as a matter of urgency. Health experts have previously warned that resistance to antimicrobials could pose a bigger threat to humankind than cancer. Around 700,000 people die every year as a result of drug-resistant infections including drug-resistant tuberculosis (TB), HIV and malaria. If no action is taken, drug-resistant infections will kill 10 million people a year by 2050, according to some estimates. Of 51 new antibiotics and biologicals currently in clinical development to treat the most dangerous antibiotic resistant diseases, WHO said only eight are classed as innovative treatments that will contribute meaningfully towards the pool of drugs. “Antimicrobial resistance is a global health emergency that will seriously jeopardise progress in modern medicine,” Dr Tedros Adhanom Ghebreyesus, director-general of WHO said. The report found very few potential treatment options for the most deadly antibiotic-resistant infections, including drug-resistant tuberculosis, which kills around 250,000 people a year. There was a “serious lack” of treatments for strains of tuberculosis and other pathogens such as E-coli, which prove particularly deadly to those with weakened immune systems in hospitals or nursing homes. “Pharmaceutical companies and researchers must urgently focus on new antibiotics against certain types of extremely serious infections that can kill patients in a matter of days because we have no line of defence,” said Dr Suzanne Hill, director of the Department of Essential Medicines at the WHO. A WHO and Drugs for Neglected Diseases Initiative earlier this month set up the Global Antibiotic Research and Development Partnership to help find groundbreaking new antibiotics. Germany, South Africa, Switzerland and the United Kingdom were among countries that pledged more than 56 million euros (£50m) towards the work. Dr Mario Raviglione, director of the WHO Global Tuberculosis Programme, said: “Research for tuberculosis is seriously underfunded, with only two new antibiotics for treatment of drug-resistant tuberculosis having reached the market in over 70 years. But WHO warned that new drugs alone would not be enough to prevent drug-resistant pathogens developing. New guidance for the use of antibiotics on people, animals and agriculture was also needed, according to the international body.